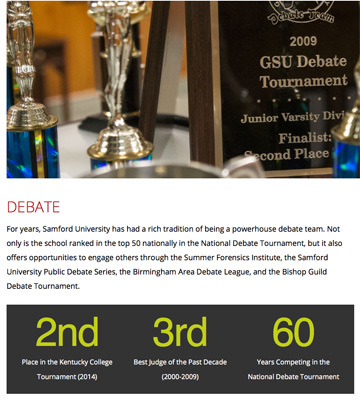 Samford University debaters enjoyed great success at the 2015 Vanderbilt Invitational Tournament in October. Seniors Natalie Bennie of Brentwood, Tennessee and Marley Davis of Mount Olive, Alabama, advanced to the elite eight of the Varsity division, with wins over Wayne State, the University of Georgia and Capital University. Sophomores Ella Oxley of McMinnville, Tennessee, and Hope Reamer of Moutain Brook, Alabama, advanced to the final four of the Junior Varsity division with wins over Wayne State and Missouri State. Reamer was fouth speaker in the division. Sophomore Wesley Staples of Killen, Alabama, competed in the novice division and was seventh speaker.